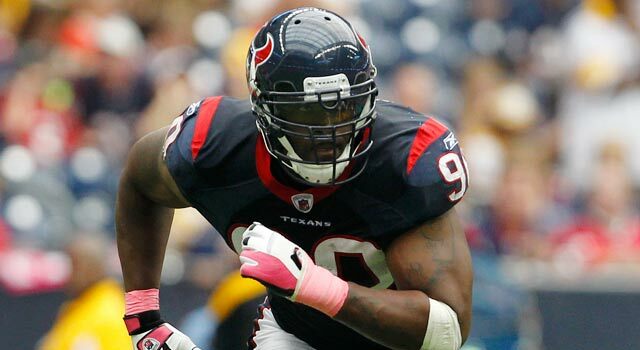 Published: Oct. 10, 2011 at 12:58 p.m.
Mario Williams was off to a fast start in the Texans' new defense, but Houston will have to play on sans the star. HOUSTON -- Losing your best player is tough to overcome. The Colts are experiencing it right now, having lost Peyton Manning (neck) for what looks like the entire season. 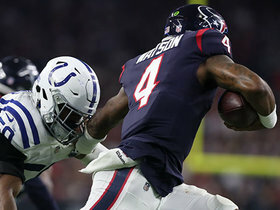 Now, the Texans will have to figure out how to shape their defense minus outside linebacker Mario Williams, who will have season-ending surgery on a torn pectoral. This is a huge blow, no doubt, but it's not catastrophic. That this is happening in Week 5 gives defensive coordinator Wade Phillips time to adjust personnel and schemes to keep the unit relatively intact. 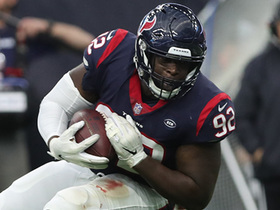 Yes, it will hurt not having a stud like Williams to occupy two offensive linemen in passing situations, but the Texans weren't solely based around his skill set. Rookie Brooks Reed will step into Williams' spot and that is a drop-off. But Phillips can find ways to cover Reed's shortcomings, possibly by tweaking what inside 'backers Brian Cushing and DeMeco Ryans do. Plus Reed, a 2011 second-round pick, has plenty of potential. 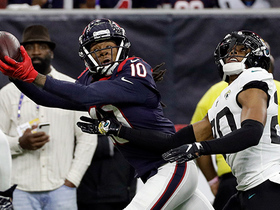 After Williams got hurt against the Raiders on Sunday, the Texans kept a steady diet of pressure on quarterback Jason Campbell and hit him several times. They also did a solid job of not allowing too many big runs by tailback Darren McFadden. Players stepped up. The Texans also don't play a murderer's row the rest of the way, although they travel to 3-1 Baltimore in Week 6. They play AFC South opponents Tennessee, Indianapolis and Jacksonville, and non-conference foes Cincinnati, Cleveland, Tampa Bay, Atlanta and Carolina. There isn't an offensive juggernaut in the bunch that would pose consistent matchup problems with Williams gone. This is not to downplay Williams' importance to the Texans. He was adjusting nicely to his move from outside linebacker and was undoubtedly Houston's top pass rusher. He already had five sacks and was destined for more as he got further adjusted and Phillips found more ways to utilize him. Phillips knows better than just about anyone how to put his stars in ideal positions. Off the field, this injury could affect Williams' contract situation (he's in the final year of his deal). On the field, from the Texans' perspective, it isn't like losing Manning or Tom Brady or Aaron Rodgers. 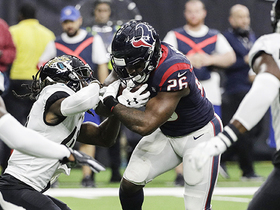 Houston can and should move on and challenge for the AFC South title.